WESTBROOK — Westbrook High School students will be without one of their favorite classmates next school year. 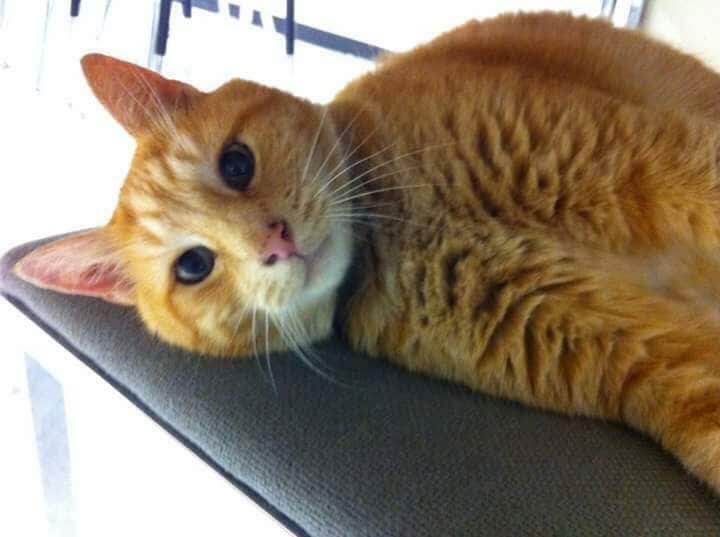 Simba, the orange tabby who was a beloved, daily visitor at the school for the last 18 years, passed away last week. “He was a friendly and social cat, so he would go over to the high school because he saw people and saw kids congregating there,” said Eileen Shutts, Simba’s owner for the last dozen years. Shutts said Simba, who she guessed was at least 20 years old, had been a fixture at the school since 2000 when he wandered there from his nearby home. Math teacher Tina Soucy was the first to let him in when he showed up by a door near her classroom. Simba quickly became a part of the school community, said Westbrook High School Assistant Principal Jennifer Brooks. “He was super therapeutic for a lot of kids. He had his own chair in the guidance office, a blue chair with light fur students knew not to sit in. When students came in sad or needed someone to talk to, the first thing they would see was Simba,” she said. “You could see in some kids how important he was in terms of stress relief and offering a calming presence in the school,” Brooks added. Simba didn’t have a set schedule, but rather came and went as he pleased, Brooks said. He could often be found in the guidance office or in Soucy’s classroom, where he was known to climb up on students’ desks for a quick nap. “For teachers and staff, if he showed up in your space, it was almost an honor,” Brooks said. Shutts said the evening custodial staff the school “loved to have Simba keep them company while they worked and stayed in touch with his family to ensure he made it home safely if it was after dark.” Sometimes, she said, he would even be given a ride home when it was cold or rainy. Ashlee Townsend, who will be a sophomore in the fall, said Simba had a way of making her smile when she was having a bad day. “Simba was probably one of the sweetest cats I had ever met, he turned my days from dark dreary clouds to cloudless bright blue skies,” she said. He was a frequent attendee at cheerleading practices, she said. “Simba was one special, beautiful spirit, and I will miss the orange cat strutting its stuff around Westbrook High School,” Townsend said. The cat has also cemented his place into Bethany Harris’ high school memories. “As a freshman, I’d walk to school every day from Spring Street. Simba’s house was near the school and every morning he’d walk me to school and would stand by the door before I went in, waiting to greet other students. Every morning I offered for him to come in, every morning he declined,” said Harris, a 2013 graduate. Simba also visited the City Council chamber at the school when council, Planning Board and School Committee meetings were in session, Shutts said. He was a good neighbor as well. “Simba made his rounds of the neighborhood and shared the gardens and laps of many. At home, too, Simba was a loving companion to his people, often funny with his antics, and he never stopped surprising with his spirit and intelligence,” she said. Not seeing the cat in the halls anymore will take some adjusting, Brooks said. “(Students) are going to grieve the loss of this cat. He was a huge part of our school community. Students would make art projects about him or write stories about him,” she said. In fact, five years ago, Simba was the subject of an art show in which more than 150 students created paintings and drawings of his likeness. The images were then printed on notecards and other items and sold as a fundraiser for the art program. Brooks said Simba, and his daily visits, wasn’t originally something school staff planned for, but in time, he was more than accepted as an honorary Blue Blaze. “He was a much bigger part of the community than anyone thought a cat could be,” Brooks said. Shutts said she is grateful for all the love the Westbrook High School community shared with Simba over the years. After visiting Westbrook High School students and staff for close to 20 years, Simba, an orange tabby owned by Eileen Shutts, has passed away. 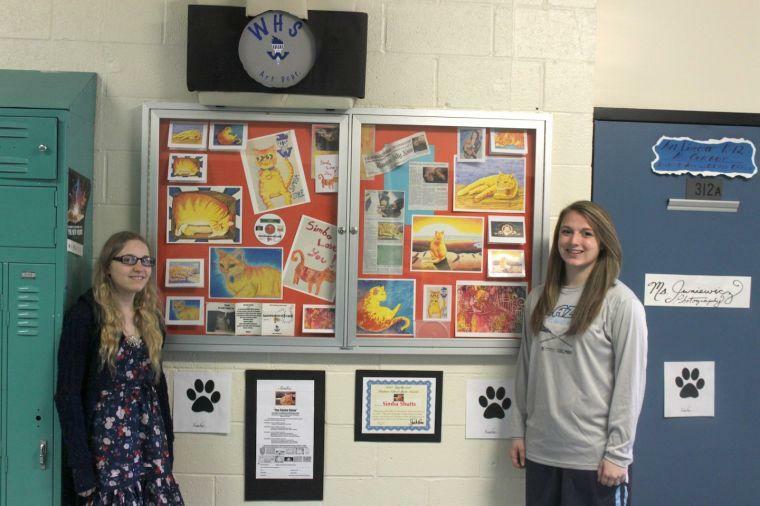 Former Westbrook High School students Victoria Simoneau and Samantha Russell were two of the students who used Simba as a muse for a school-wide art show back in 2013. 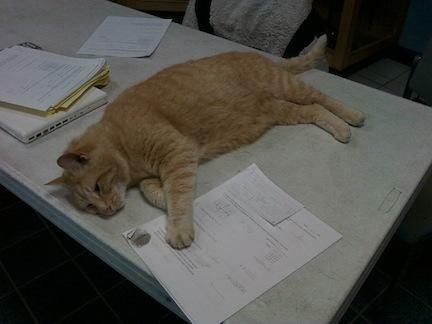 If he was not in his favorite chair in the guidance office, Simba could often be found taking a cat nap on a desk. 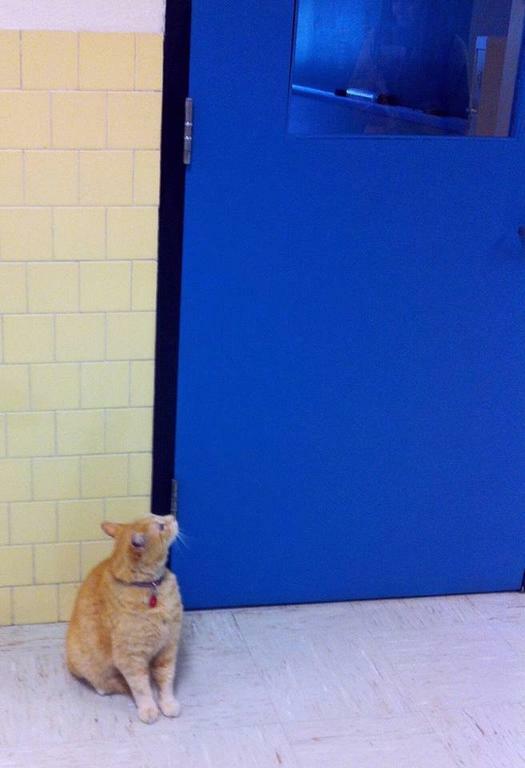 After arriving at the high school, Simba would patiently wait until someone opened the door for him so he could roam the halls, much to the delight of students and staff.